The fourth round of the 2018 Gul Golden Dolphin series is now beginning to recede into memory even if the bruises aren't! 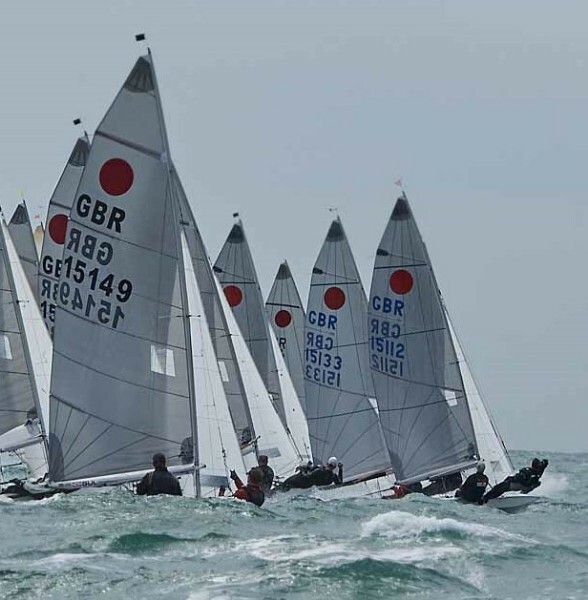 The Hayling Island SC (HISC)meeting was a breezy, bumpy affair; watch out for Russ Clark's report in the next day or two! With 50 entries so far, the Golden Dolphin series now enters the interesting phase of discards (5 races 4 to count) but we'll have to wait until Staunton Harold's meeting over the weekend of 22/23 September to see who comes out on top. There are the minor matters of the Nationals and the Worlds beforehand! Interest in the Silver and Bronze fleet placings also starts to heighten as the helm and crew of the first three finishers in both fleets will each receive a substantial prize from Gul - wetsuits for those placed first overall! The latest standings are now available on the UKFA website:. Kevin Hope & Russell Thorne retained their overall lead over the weekend but it's still all to play for. Photo, taken shortly after a second day start, courtesy of Rob O'Neill.